It’s a wonderful thing to work with animals in agriculture. For viniculture one of the most interesting species are sheep. They can be used to feed down the greening in the vineyard or to get the bottom leaves of the vines removed. We have a few vineyards with tricky embankments where I have to spend a lot of time with the brush cutter or the hoe. Also it hurts me every time the vegetation needs to be mulched – so many beetles and spiders die as collateral damage. So we’re giving it a shot. 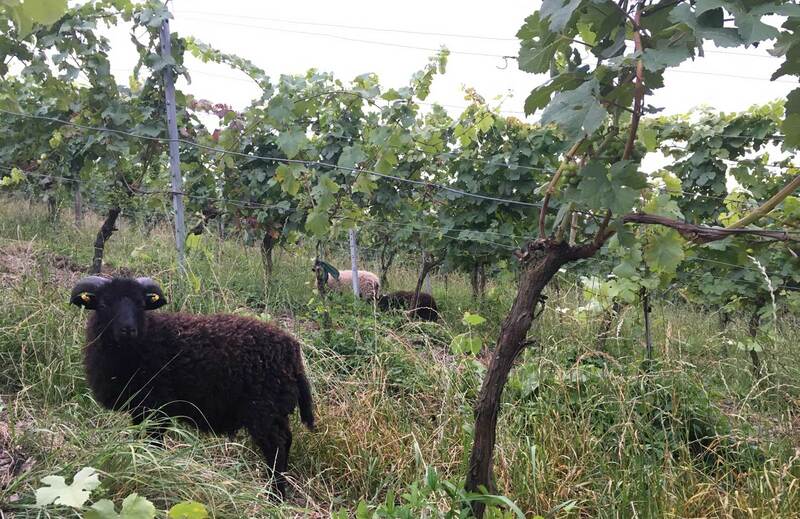 Since August a small group of seven sheep, cute little Ouessants, has been “working” in our Domina-vineyard. It’s one of our oldest organic vineyards and it will hopefully make a beautiful Rosé this year. It’s been a pleasure to observe them picking their preferred food (for now this was bearbind and the you leaves of the vines). They’re supposed to stay in the vineyards the whole year. My friend Christian from the LBV (the guy I’m working with for our bat project) is working with me on that project again. He managed to organize a field next to the vineyard which is now being transferred to a meadow – a big thank you! It’s going to come in very handy when we notice that the sheep will have to leave the vineyard for a little while. There are still loads of questions open. Will there be enough greening in the vineyard for the whole winter (yes, I have a backup plan)? Will the sheep do damage after bud break (I fear they will – but vines have a different hight in different vineyards)? How can the fence management be optimized so the tractor can get in and out easily (unimportant before April)? How fast will they eat? Will they reduce the unloved couch grass? Well, I guess I’ll figure it out the next months. You have to get started at some point. An old farmer once told me watching your animals is better than any TV-show. He is absolutely right.